I would like to invite you to our very unique Taekwondo club in Carrigtwohill, Cork. We teach Taekwondo like it was meant to be and this is reflected in the approach we use and in some of the classes that only we teach in Europe. Our club is a tightly knit family of instructors, students and parents, and one that is continuously growing. We have a range of classes running each week and a great team of Black Belts who work hard to teach and share what they have learned to our students. Your first Taekwon-do suit (Dobok) is FREE! Kids’ beginner classes (from age 3) are offered Mondays, Wednesdays and Saturdays, and beginner adults classes on Monday and Wednesday evening. Advanced students have a great selection of classes in which to train daily, including our new Fitness and Stretching classes which have been added at no extra cost. Please visit our class schedule for full details. 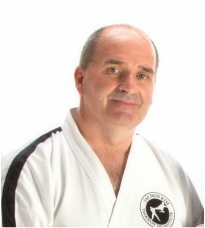 All classes are supervised by Master Cyril McSweeney – (6th degree) Black Belt with over 30 years experience. The club utilizes a continuous enrollment system which allows you to start your training in at any time throughout the year. Potential members are invited to come and observe a class at our Dojang in Carrigtohill Community Centre, and may also attend a class for free. On joining, new members will receive a Free club Dobok. There are no additional charges for colour belt gradings and belts are supplied to members free of charge.